This Saturday my wife and I decided to ignore the rain in the forecast and head to Broken Bow, Oklahoma for some kayaking. It has been too long since we last paddled this fun few miles in southeastern Oklahoma. I love this river! My buddy Yakker joined my Wife and I on this river trip, so we were able to self-shuttle for a change. I like to self-shuttle... not so much to save money (I'm not sure it does), but in order to get on the water earlier. This sort of worked because we did arrive at the put-in before any of the outfitters starting dropping off paddlers. Sadly, it was raining buckets at the time! This part of Oklahoma has not gotten enough rain to even settle the dust this summer, but they made an exception for us. As usual around Nine o'clock the outfitters started dropping off paddlers. Some had rain gear, others only had their high hopes of improving conditions. We decided to burn another hour before launching, figuring it couldn't rain for long. We were quickly rewarded with a cloudy but rainless sky and it just got sunnier all day after that. As always, I had a ball weaving through the rocks, slipping down the chute and splashing down the tiny waterfalls. The light was not all I hoped for, but at least I made it on an off the river with my camera still in functional! Launching as late as we did on a Saturday means you get to enjoy a lot more company on the water. Picking your line through the Rock Garden or The Chute requires dodging many canoe paddlers struggling to rescue their water filled boats. For added fun, stop and help from time to time. However, pace yourself you cannot help them all! Paddle a SOT kayak alone. Sharing a canoe with another novice paddler is just about the worst choice you can make. Bring nothing with you but sunscreen... and even the sunscreen needs to be waterproof! Towels, wallets, dry clothes & electronics stay in the vehicle, not in the canoe. Reserve your boats in advance with one of the LMF River paddling outfitters. To rescue your canoe with your friend: move the canoe out of the current, grab it by the ends and lift it out of the water while you rotate it 360 degrees. For the most part the boat will find its own way downriver, if you keep the nose pointed down river. Even backwards is OK. However, IF your boat turns sideways to current, it is likely to fill with water the minute it hits an obstacle. Because canoes are usually around 16 feet long...you will hit just about any obstacle in the area. Renting a SOT kayak puts you in a 9 foot long boat that can turn on a dime and WON'T fill up with water. First time paddlers on this river find more success by renting a sit-on-top kayak and even if you do run into a problem, they are much easier to self-rescue. Fall starts this week. Summer is the most popular time for trying out kayaking, but experienced paddlers usually prefer the Spring & Fall months due to better water levels, fewer crowds and cooler weather. 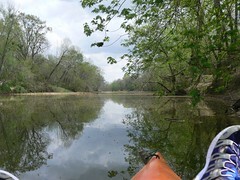 Check out some of the paddling locations described on the OklahomaRoadTrips.com website and plan a kayaking trip soon! 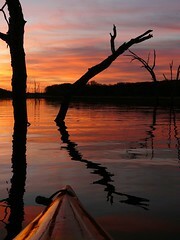 Take a kayak trip on a local OKC lake or river to enjoy the sunset just as the full moon is rising. You’ll enjoy great scenery, majestic views and a unique kayaking experience. The event is weather dependent and takes place two to three evenings per month from May to September. Price for ages 16+ is $25 or $12.50 for RIVERSPORT Row/Kayak pass holders. While you are there learn all about the Oklahoma Regatta Festival October 1-2, 2011. Also remember, the Illinois River in Tahlequah, OK is still running at a great level for paddling trips! Kiamichi River Spring, a photo by FreeWine on Flickr. But don't let that stop you from kayaking the Illinois River this weekend! The new Oklahoma Paddle Sports Association has an Illinois River Kayaking Trip planned (non-members allowed). Checkout their website at: http://ok-psa.org if you would like to join them. You can even see my devoted spouse in their most recent newsletter! FYI - The 12th Annual Okie Noodling Tournament is July 9, 2011 and the sign-up form is online now deadline for registration is July 6, 2011. Join in or just attend and check out the massive catfish they catch at this Pauls Valley, Oklahoma Summer event. Oklahoma has been blessed with some beautiful weather lately. Kayak fishing season is on! 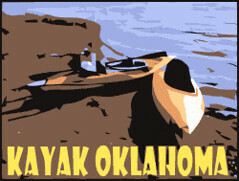 Load of the kayaks and head to Okmulgee State Park to meetup with some other Oklahoma kayak anglers. The place is Hickory Point Boat ramp at 7am Saturday morning. Kayak fishing is not really a team sport, but it is fun to get together and see how everyone customizes their boat. No special permits are needed for paddling on the two lakes at the State Park, just make sure you have your boat registered and your fishing license handy. Kayak fishing for Bass is a great way to get outdoors and have some low cost fun. Okmulgee State Park offers to excellent lakes for paddling and fishing. For shady, peaceful paddling with friends try finding the put-in at the top of Salt Creek and paddling down to the Hickory Point Campground. If you like kayaking between the trees and chasing trophy Bass launch onto Dripping Springs Lake from the boat ramp at Clovis Point Campground. We had record snowfall leading up to our 17th anniversary celebration trip to Caddo Lake. Thankfully, we were blessed with shockingly great weather right afterwards. The great weather was throughout the region too, not just at our cabin in Uncertain, Texas. The northeastern part of the massive Caddo Lake is about five hours from our home in Okmulgee, Oklahoma. We picked up a fishing license for Dianne at the Wal-Mart in Marshall, Texas but you can save some money by just doing your fishing at the nearby Caddo State Park. It has a two dollar entrance fee, but no license is required for fishing there. This time of year, Caddo Lake is popular among Bass and Crappie fishing enthusiasts. However, we arrived a bit early for the kickoff of the spawning season. This lake is so full of fish that Dianne actually caught a Bass on her limb lines last summer. Bass normally require a bit more finesse than the oiled twine and massive hook of a catfish set, but I suppose they are just a bit more eager in these parts. If you can't catch your own, try the River Bend Restaurant for waterfront views plus catfish & gator with all the trimmings. We were surprised at the quality of food and wine at this hidden jewel in Uncertain, Texas. Dianne did catch catfish on this trip, but we spent most of the time exploring Caddo Lake in our kayaks and driving around the 'Ark-La-Tex' as they call it around here. If you visit Caddo Lake, I highly recommend you make a quick side trip to Jefferson, Texas. Grab a breakfast that just can't be beat at The Bakery restaurant in downtown Jefferson. There is also history to learn and shopping to do in Jefferson, but we were there for the grub. While we were walking around, we noticed a big old free boat ramp right there in town. 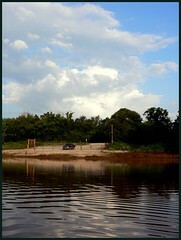 When we return next time, we will definitely be using that boat ramp for a quick paddling trip on Big Cypress Bayou! Like most of Caddo, it appears to be narrow, shady and curvy...just the way I like 'em! Perfect for paddling or kayak fishing in any season. A couple of the mornings started out quite cold this vacation weekend. My first day of paddling, I launched before dawn to catch that great early morning light. The season had stripped the bald cypress trees of their color, but the Spanish Moss that drapes their limbs was unchanged by winter's icy embrace. Caddo Lake has a gloomy beauty that is still present in February, but it is much diminished. More Caddo Lake pictures to come, watch our Flickr photostream. Spatterdock, the cabin we rented, offers a lovely view of the bayou from a large screened porch. Canoes and bicycles are provided with the cabin rental, plus there is a boat ramp just a few steps away. The cabin can sleep as many as nine and is just one of four cabins that Billy and Dottie Carter operate on Caddo Lake. 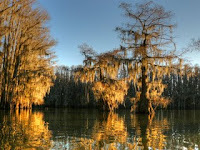 You can also hire Billy for a guided boat tour of Caddo Lake: http://www.spatterdock.com/. A guided boat tour is great idea, if you want to see the biggest, oldest, most impressive Cypress trees on the lake. They also teach you quite a bit about the local history. During the warmer months your tour includes boating through a sea of lily pads and lotus blooms. It is breathtaking. Winter kayaking on Caddo Lake is not as colorful, but it is more solitary. Since it is the off-season you enjoy lower rates and no waiting in town. On the water, the maze-like corridors of tall Cypress trees provide countless miles of great exploring and paddling. Moving quietly through the shadows allows you to slip-up on wildlife for close observation. If kayak photography is your thing, Caddo Lake is unbeatable. Even on a windy day, you will find the sheltered lanes offer calm water and amazing light filtered through the treetops and moss. Caddo Lake even sounds strange. The tops of the Cypress trees rub together when the wind blows, creating random squeaks and moans that echo across the water. Caddo Lake is a kayaking experience too uniquely wonderful to be missed. Sunset Kayaking on a Warm Winter Day in Oklahoma! Saturday was perfect for kayaking in Oklahoma. I hope you got outside. Dianne, Greg and I took the plastic navy to Dripping Springs Lake. They were kayak fishing while I was busy watching the skies for some of our local fishing birds. I spotted two Bald Eagles and had a great day in the sun paddling. More pics on Flickr, as usual. The water level is still very low on Dripping Springs Lake. It has been a wickedly dry year. The Deep Fork River is not even red because Oklahoma has been dry for so long. Although the air was warm today, we realize that the water was still very cold. It is important to wear quick drying synthetics or waterproof clothes when you are doing any winter kayaking in Oklahoma. The nylon strap that supports the seatback on my Perception Swifty just broke on this trip. It has been a tough kayak, this will be my first repair for the Swifty. Hopefully, I can grab some good pictures to share with you in February. Dianne and I are planning a trip back to Caddo Lake to see how it looks in the winter and hopefully do some kayak fishing. I'm told the Bass fishing on Caddo Lake is excellent from Jaunary through May, so we should be right on time. It would be great to have more weather like today for our trip.